Out for a hike in my big backyard the other day I nearly stepped on a tarantula! We’ve had a few really chilly nights so I thought I had seen my last tarantula of the season, but apparently not. I love seeing these crazy huge furry spiders! For one thing, they crawl very deliberately, so it’s easy to judge where they’re going and stay out of their way. There’s no darting or leaping. The creepiest part of seeing a tarantula is that they definitely see you too. This one stopped and turned to face me and raised its pedipalps – the two feelers in front of the eight walking legs – to say watch out! I’m walkin’ here! When Dio came over to check out what I was looking at, she turned and warned him too. I think this is probably a female Texas brown tarantula. Females have smaller pedipalps and, in this species, are often lighter in color than the males. It’s rare to see a female because they seldom leave their dens, but they are more highly coveted by collectors because they can live for years while males rarely survive a single season. Man, I’m glad I didn’t step on her! That would make quite the revolting crunch, plus it’d be bad for my karma. Don’t mess with them and they won’t mess with you. Tarantulas seldom bite, and they’re not poisonous to people or dogs. I’ve heard their bite described like a bee sting: painful with some swelling but no side effects. After watching her for a few minutes, we went our separate ways. Desert hiking lesson of the day: always watch your step! This entry was posted in Bowie & D.O.G., Hiking!, New Mexico, Photography. Bookmark the permalink. 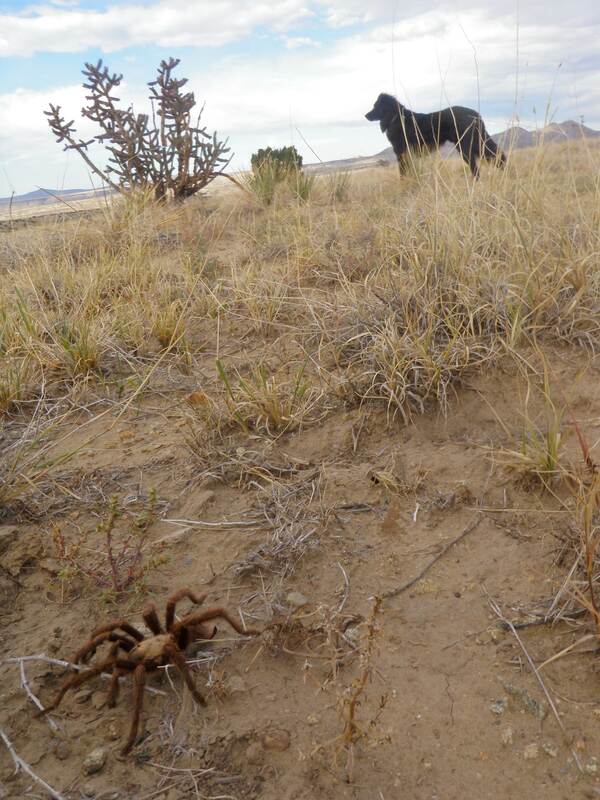 4 Responses to Crossing paths… Tarantula! I remember my Mother saying that her brother and his friends used to play with tarantulas when they were growing up in Arkansas. Not being a spider lover, I could not understand why that would be fun. Love reading about your adventures.